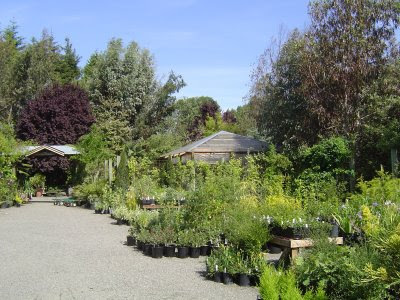 I am such a lucky gardener; there are so many fabulous nurseries here in Oregon, many of them very close to my home. Of course one of my favorites is Cistus, and this year I’ve had several opportunities to visit. Over the past year I’ve blogged so many times about trips to this nursery (4 actually) that I’ve stopped, lest you all get bored with me carrying on about them. From the tag...Agave funkiana 'Blue Haze' selected for its striking foliage, toothed and narrowing to a sharply pointed tip with a pale to nearly white mid-stripe on the powdery blue leaves. Rosettes can reach up to 2 ft tall and wide. Sun and well-drained soil required. Drought tolerant but occasional summer water speeds growth and generally enhances the appearance. Frost hardy to 15F, mid USDA zone 8. Otherwise a happy container plant. This new agave purchase got me wondering just exactly who has the largest private agave collection in Oregon? I want to know…and where does the danger garden rank? And how would I ever go about finding out? These are the questions that keep me up at night! Okay, not really…but I am curious. Well that’s all it took. I had noticed a couple in the nursery and been flirting with the idea. His interest just pushed me over the edge and now we own one. From the tag...Pseudopanax ferox toothed lancewood, one of those cool dinosaur plants found down Kiwi way that catches the eye and triggers the lust gene in plant geeks and adventurous gardeners. 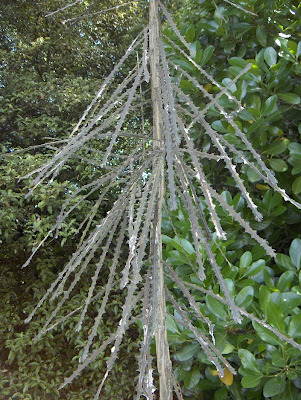 Juvenile leaves are dark brown, long, very narrow, stiff, and saw-toothed, growing downward from a central stem -- odd indeed. Slow growing; trees reach 20 ft in 20+ years, only then producing adult foliage, shorter, wider, and green. Sun to dappled or bright shade and regular summer water. Frost hardy in USDA zone 8b in a sheltered location, though even in Portland we keep most of ours in containers and shelter during winter cold. So it’s come to this. We are such plant geeks that paid $30 for a pot with a few dead brown sticks in it…or so said my mother-in-law. Plant nerd :) I love the Pseudopanax ferox toothed lancewood! Never even heard of it before. I love the orange stripe! It's going to look great in your yard! Nice dead brown sticks. Kidding. I'm such a sucker for odd plants. That's a handsome leaf! I love your newest agave, too. I saw someone else's [Jane's?] affection for this Agave too. Nice. Megan, takes one to know one? Laura, I wish it could go in the ground, but I think it will have to stay in a container. Megan, yes...this is one of the things I like about you! Grace, it was ricki, she bought one too. We were probably even there at the same time. I recall a neighbor looking at my newly planted 'toffee twist' and saying..."is that alive?"...haha. We need mother-in-laws to keep things in perspective. Love Pseudopanax -- had a client that had a couple of different species in her garden. I'm a complete sucker for plant oddities. UC Santa Cruz Arboretum has some nice mature specimens.